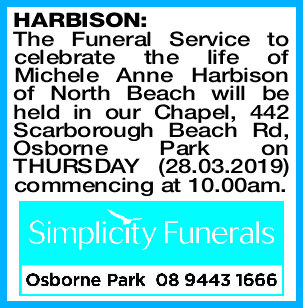 The Funeral Service to celebrate the life of Michele Anne Harbison of North Beach will be held in our Chapel, 442 Scarborough Beach Rd, Osborne Park on THURSDAY (28.03.2019) commencing at 10.00am. HARBISON MICHELE Mother to Jerusha and Symone. Nan to Emily, Jessica, Joslin and Molly. With great sadness in her loss, but joy we feel, having had her in our lives, we farewell Michele. Our mum, nan, sister, aunty and animal warrior to the very end. HARBISON MICHELE You passed away suddenly and too soon. Rest in peace Michele. We will treasure the loving memories we have of you and you will always be in our hearts. Thank you for being in our lives, as a special sister, kind sister-in-law and dear friend. your brother Tony, Gabi and Jules. And all the animals you rescued, fostered and adopted over many years. HARBISON MICHELE Michele will be sadly missed by all her loved ones. Our prayers and deepest sympathy from Cecilie, Bruce and family. Heartfelt sympathy to Peter and all the Harbison family on the sudden passing of dear Michele. Our thoughts are with you all at this sad time. Love the Atwell family.